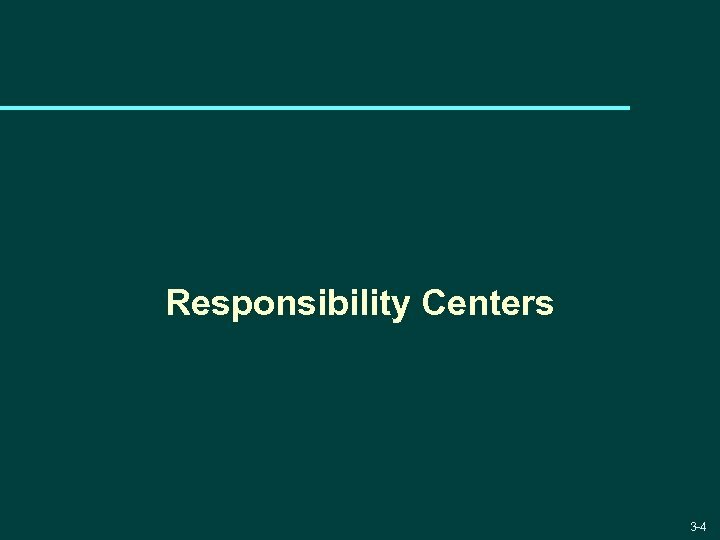 What is a responsibility center? u In simple words: an organizational unit for which a manager is made responsible. u Examples: A specific store in a chain of grocery stores. u A work-station in a production line manufacturing automobile batteries. u The payroll data processing center within a firm. 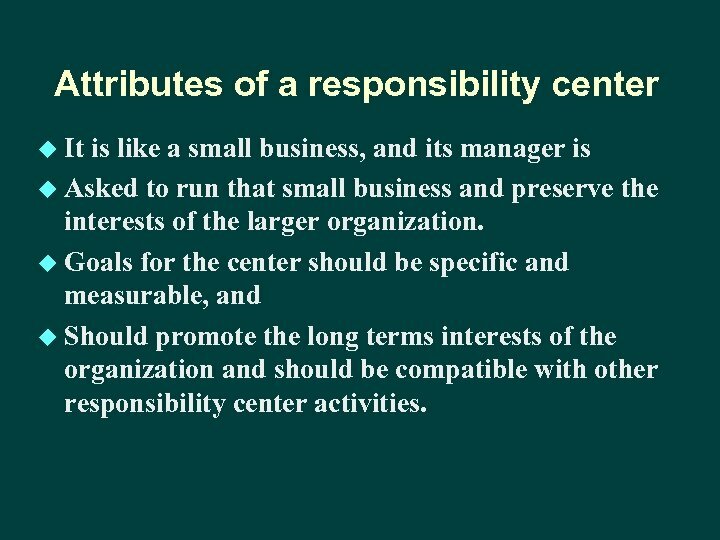 Attributes of a responsibility center u It is like a small business, and its manager is u Asked to run that small business and preserve the interests of the larger organization. u Goals for the center should be specific and measurable, and u Should promote the long terms interests of the organization and should be compatible with other responsibility center activities. 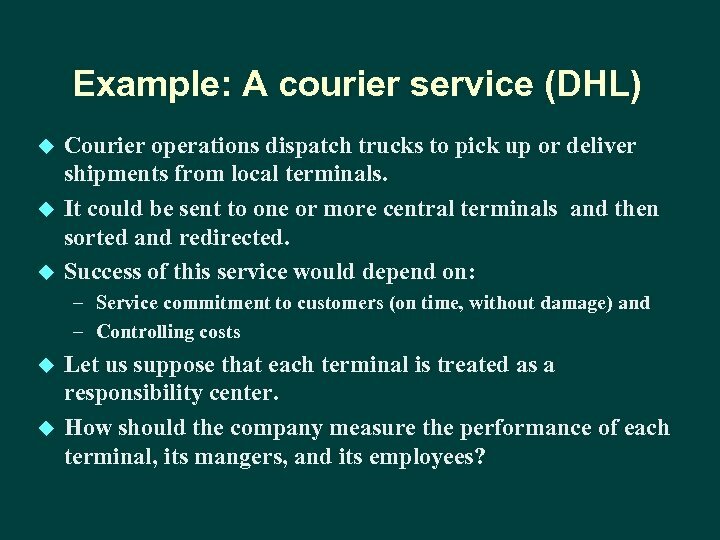 Example: A courier service (DHL) u u u Courier operations dispatch trucks to pick up or deliver shipments from local terminals. It could be sent to one or more central terminals and then sorted and redirected. Success of this service would depend on: – Service commitment to customers (on time, without damage) and – Controlling costs u u Let us suppose that each terminal is treated as a responsibility center. How should the company measure the performance of each terminal, its mangers, and its employees? Measuring the performance of the courier-terminal responsibility center u u u To focus on efficiency: we could measure no. of parcels picked up, sorted or delivered, per route, per employee, per vehicle, per hour or per shift. To focus on customer service, we could measure each group’s contribution to customers: proportion of the time the terminal met its deadlines, when terminals are required to sort shipments, what the sorting error rate was. We could also measure customer service by: no. of complaints operations group receives, average time taken by the operation group to respond to complaints, and no. of complaints of poor, or impolite service. 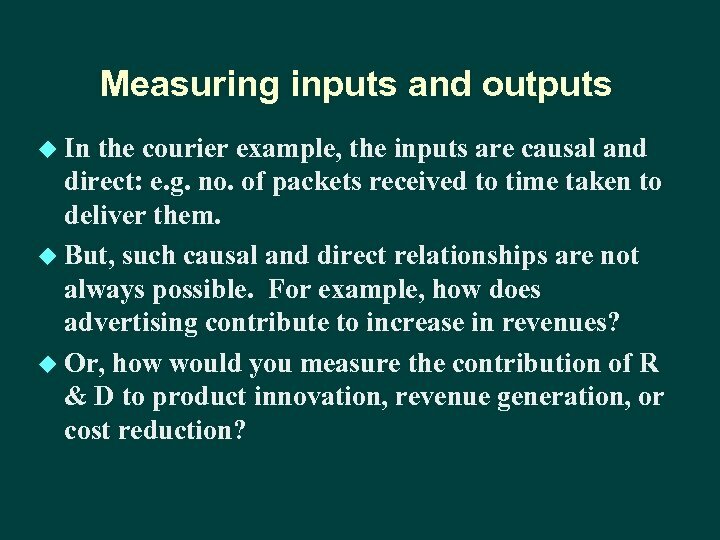 Measuring inputs and outputs u In the courier example, the inputs are causal and direct: e. g. no. of packets received to time taken to deliver them. u But, such causal and direct relationships are not always possible. For example, how does advertising contribute to increase in revenues? u Or, how would you measure the contribution of R & D to product innovation, revenue generation, or cost reduction? 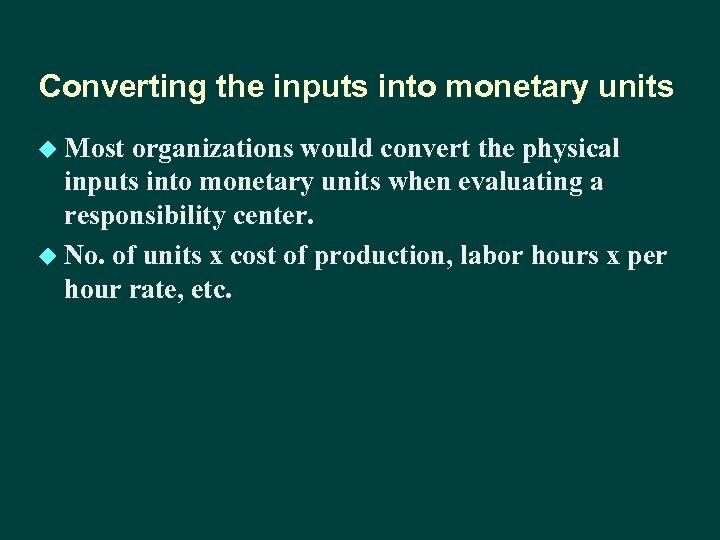 Converting the inputs into monetary units u Most organizations would convert the physical inputs into monetary units when evaluating a responsibility center. u No. of units x cost of production, labor hours x per hour rate, etc. Measuring outputs u Measuring outputs is more difficult. This is because: u Input may be extended this year but outputs (benefits) may be received over several years (e. g. employee training). 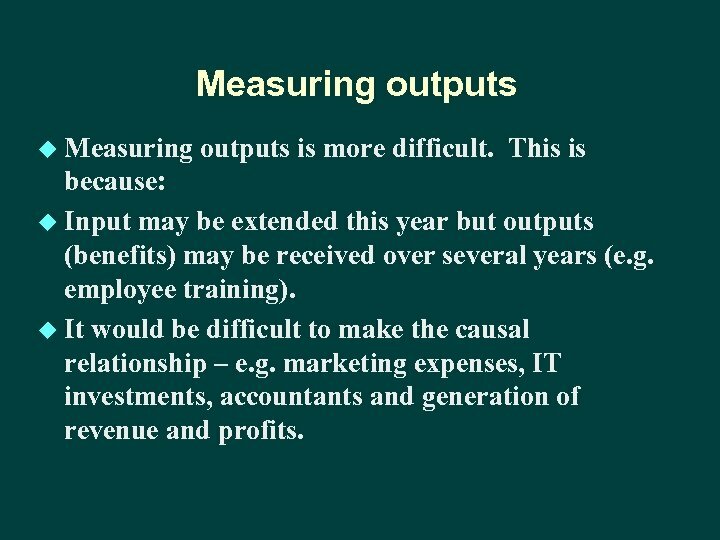 u It would be difficult to make the causal relationship – e. g. marketing expenses, IT investments, accountants and generation of revenue and profits. 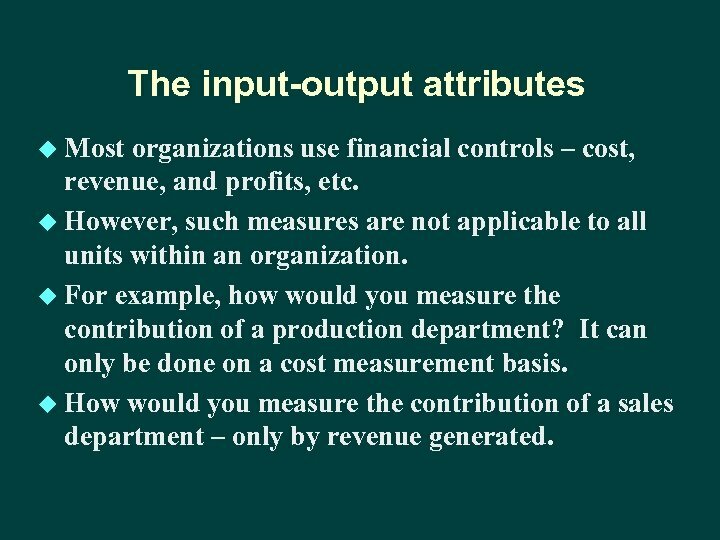 The input-output attributes u Most organizations use financial controls – cost, revenue, and profits, etc. u However, such measures are not applicable to all units within an organization. u For example, how would you measure the contribution of a production department? It can only be done on a cost measurement basis. u How would you measure the contribution of a sales department – only by revenue generated. 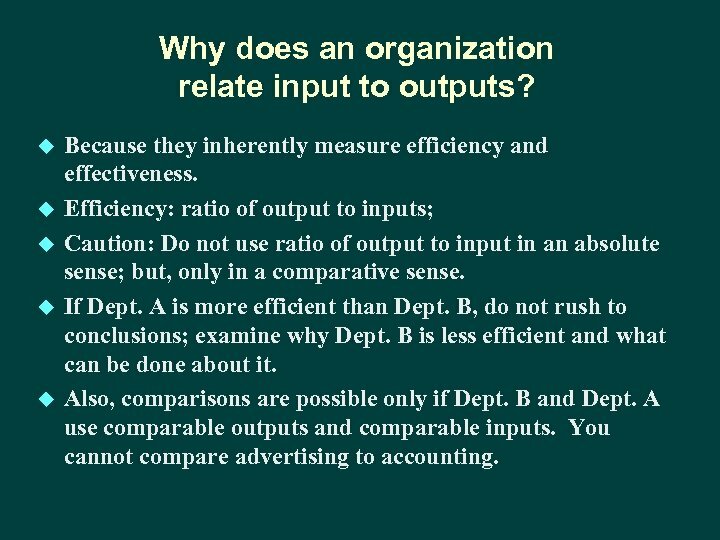 Why does an organization relate input to outputs? u u u Because they inherently measure efficiency and effectiveness. Efficiency: ratio of output to inputs; Caution: Do not use ratio of output to input in an absolute sense; but, only in a comparative sense. If Dept. A is more efficient than Dept. B, do not rush to conclusions; examine why Dept. B is less efficient and what can be done about it. Also, comparisons are possible only if Dept. B and Dept. A use comparable outputs and comparable inputs. You cannot compare advertising to accounting. 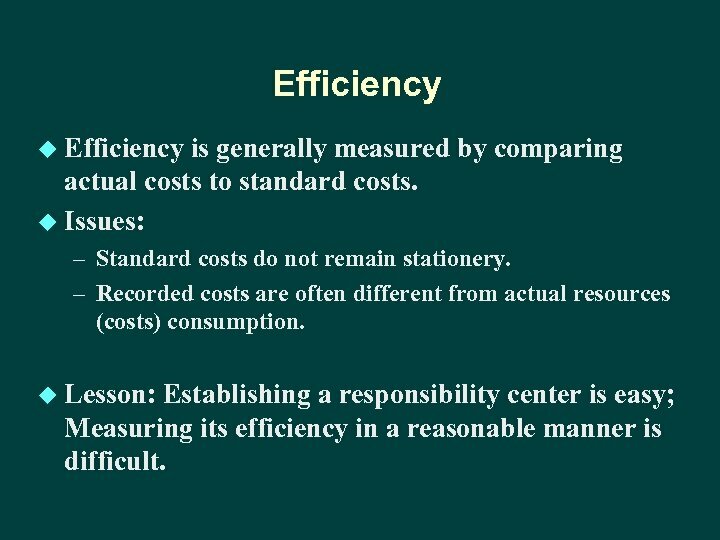 Efficiency u Efficiency is generally measured by comparing actual costs to standard costs. u Issues: – Standard costs do not remain stationery. 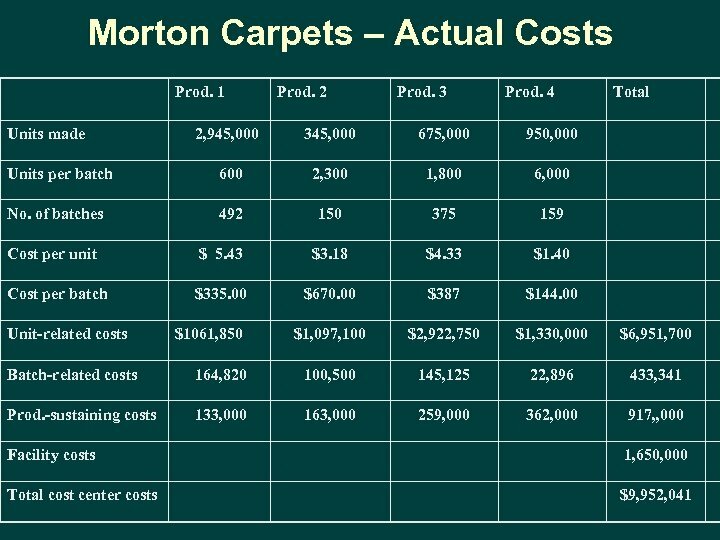 – Recorded costs are often different from actual resources (costs) consumption. 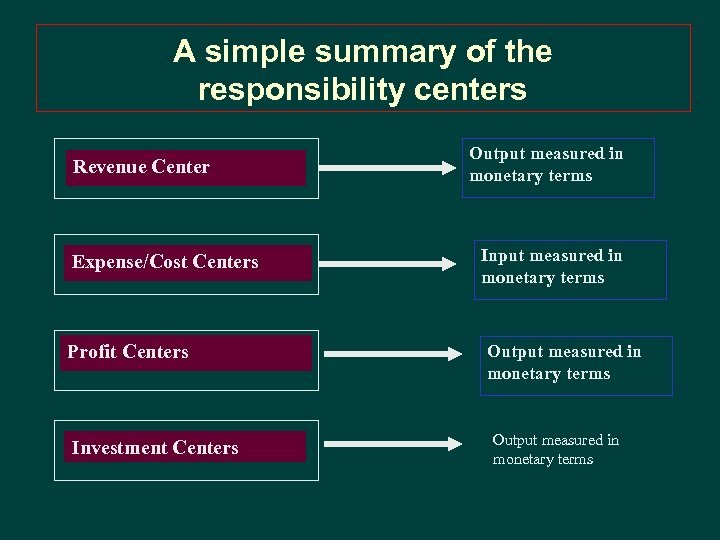 u Lesson: Establishing a responsibility center is easy; Measuring its efficiency in a reasonable manner is difficult. 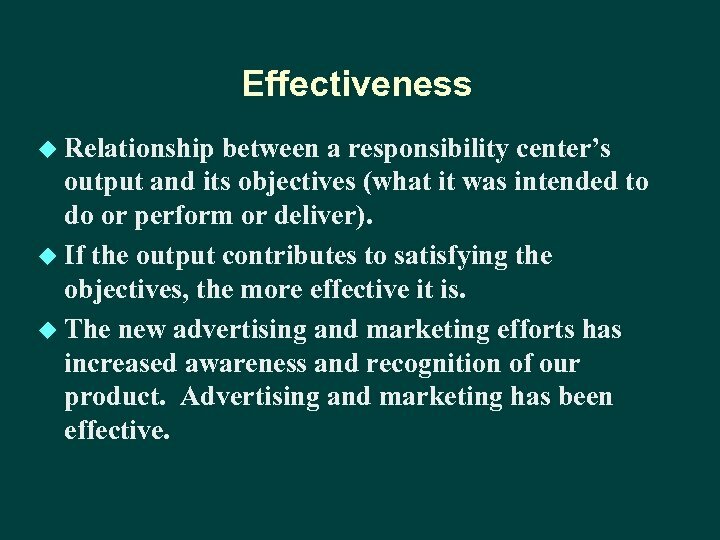 Effectiveness u Relationship between a responsibility center’s output and its objectives (what it was intended to do or perform or deliver). u If the output contributes to satisfying the objectives, the more effective it is. u The new advertising and marketing efforts has increased awareness and recognition of our product. Advertising and marketing has been effective. 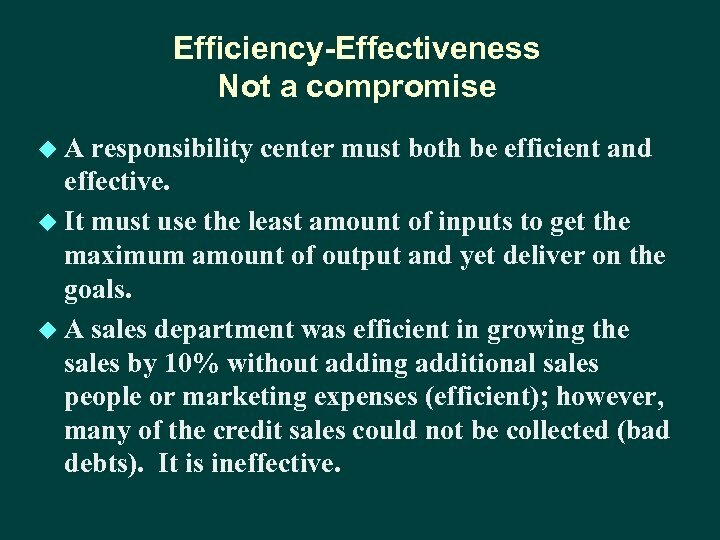 Efficiency-Effectiveness Not a compromise u. 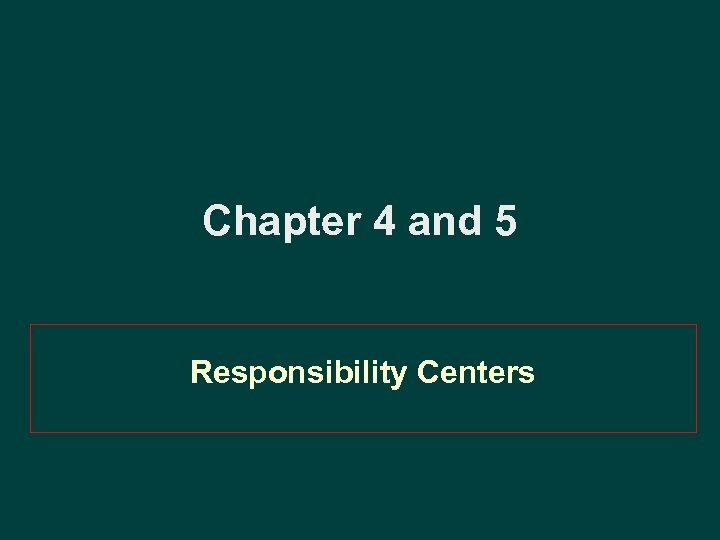 A responsibility center must both be efficient and effective. u It must use the least amount of inputs to get the maximum amount of output and yet deliver on the goals. u A sales department was efficient in growing the sales by 10% without adding additional sales people or marketing expenses (efficient); however, many of the credit sales could not be collected (bad debts). It is ineffective. 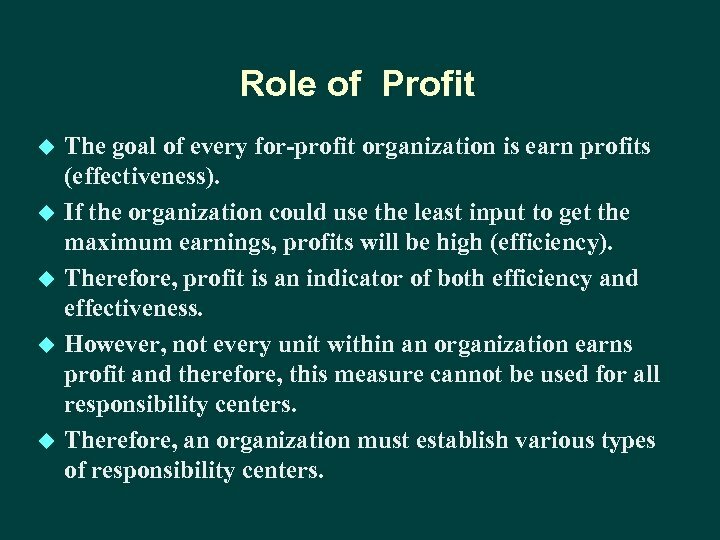 Role of Profit u u u The goal of every for-profit organization is earn profits (effectiveness). If the organization could use the least input to get the maximum earnings, profits will be high (efficiency). Therefore, profit is an indicator of both efficiency and effectiveness. However, not every unit within an organization earns profit and therefore, this measure cannot be used for all responsibility centers. 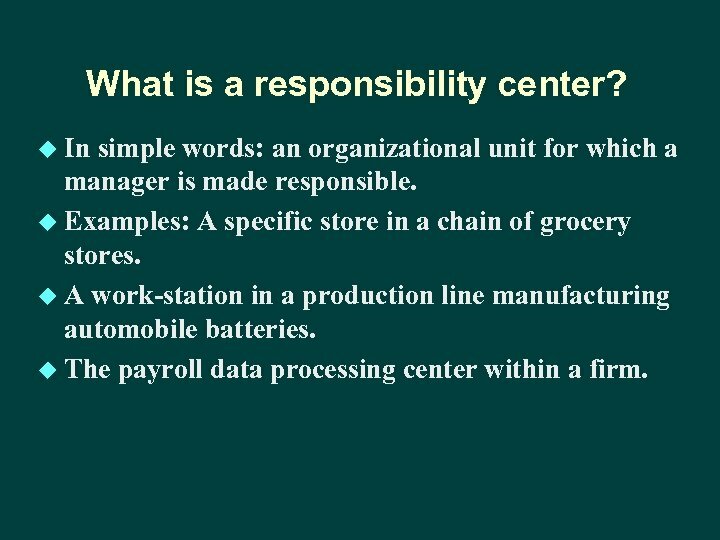 Therefore, an organization must establish various types of responsibility centers. 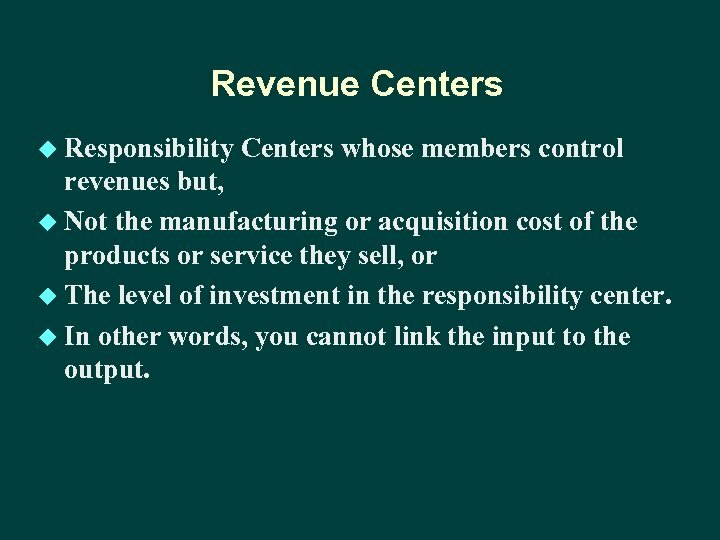 Revenue Centers u Responsibility Centers whose members control revenues but, u Not the manufacturing or acquisition cost of the products or service they sell, or u The level of investment in the responsibility center. u In other words, you cannot link the input to the output. 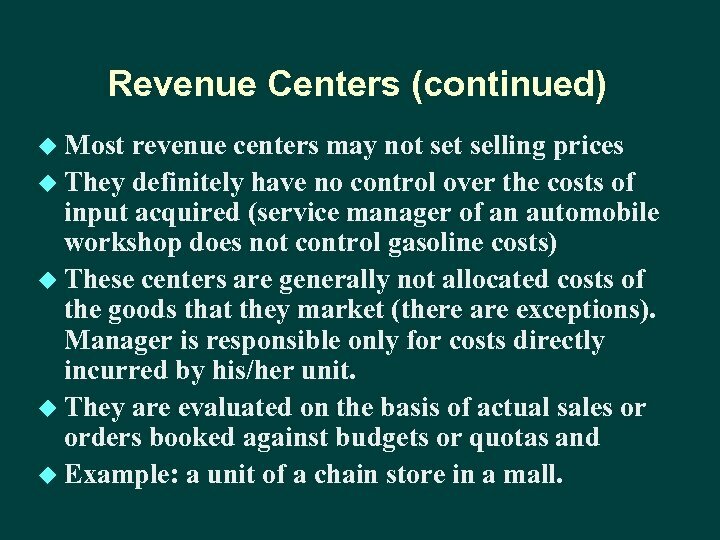 Revenue Centers (continued) u Most revenue centers may not selling prices u They definitely have no control over the costs of input acquired (service manager of an automobile workshop does not control gasoline costs) u These centers are generally not allocated costs of the goods that they market (there are exceptions). Manager is responsible only for costs directly incurred by his/her unit. u They are evaluated on the basis of actual sales or orders booked against budgets or quotas and u Example: a unit of a chain store in a mall. 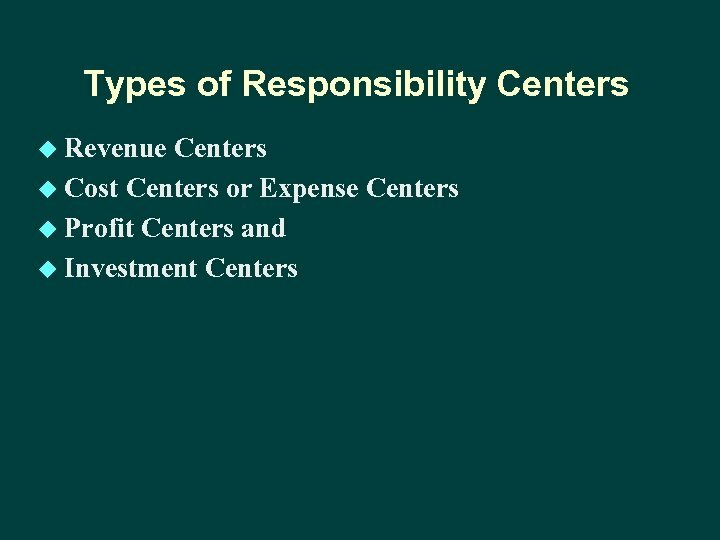 Expense/Cost Centers u u Responsibility centers whose employees control costs, but Do not control their revenues or investment level. 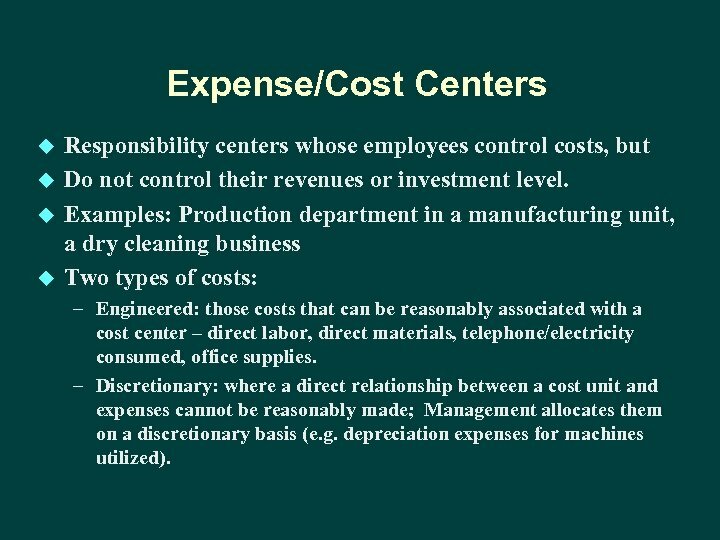 Examples: Production department in a manufacturing unit, a dry cleaning business Two types of costs: – Engineered: those costs that can be reasonably associated with a cost center – direct labor, direct materials, telephone/electricity consumed, office supplies. – Discretionary: where a direct relationship between a cost unit and expenses cannot be reasonably made; Management allocates them on a discretionary basis (e. g. depreciation expenses for machines utilized). 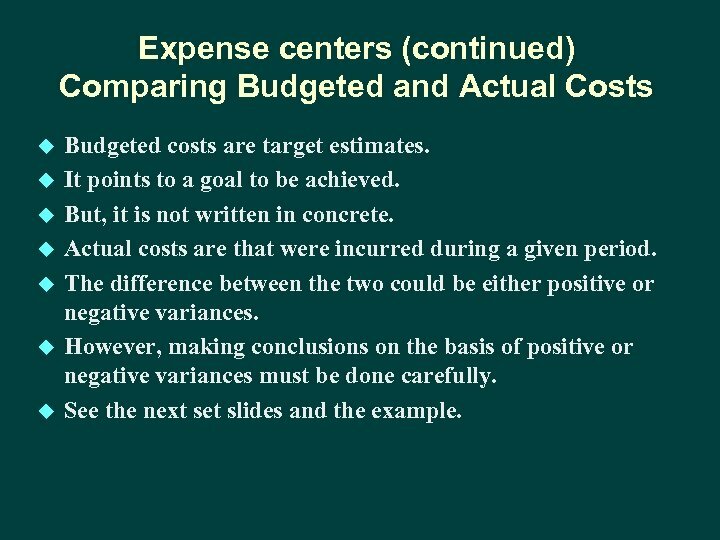 Expense centers (continued) Comparing Budgeted and Actual Costs u u u u Budgeted costs are target estimates. It points to a goal to be achieved. But, it is not written in concrete. Actual costs are that were incurred during a given period. The difference between the two could be either positive or negative variances. However, making conclusions on the basis of positive or negative variances must be done carefully. See the next set slides and the example. 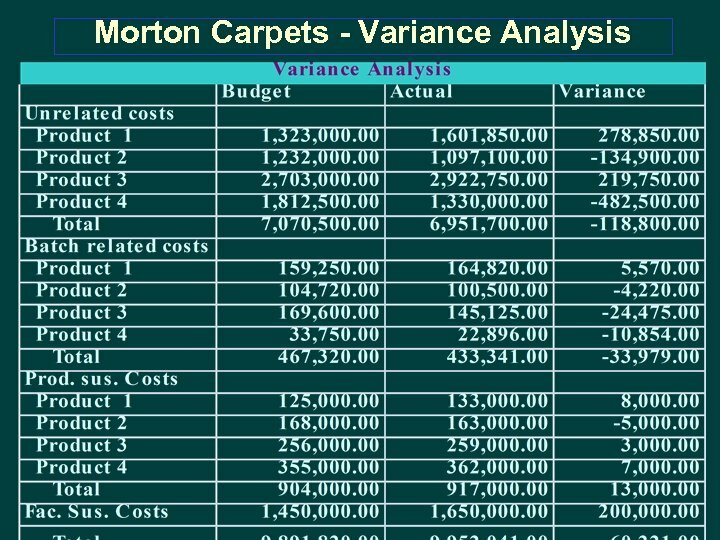 What do we learn from the variance analysis of Morton Carpets? u The variance analysis presents a mix of positive and negative variances. u Example: Product 1 and 3, unit-related costs were higher than planned, and u For products 2 and 4 they were lower than planned. u In total, the unit-related costs and batch-related costs were lower than planned and the productsustaining and facility-sustaining costs were higher than planned. 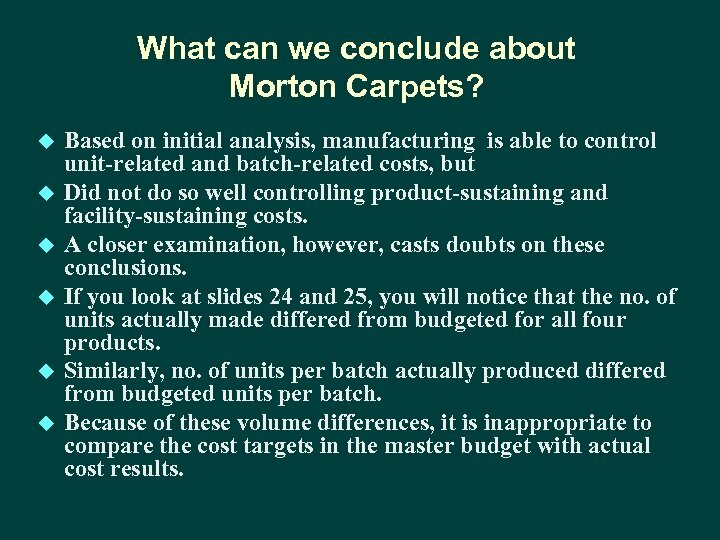 What can we conclude about Morton Carpets? u u u Based on initial analysis, manufacturing is able to control unit-related and batch-related costs, but Did not do so well controlling product-sustaining and facility-sustaining costs. A closer examination, however, casts doubts on these conclusions. If you look at slides 24 and 25, you will notice that the no. of units actually made differed from budgeted for all four products. Similarly, no. of units per batch actually produced differed from budgeted units per batch. 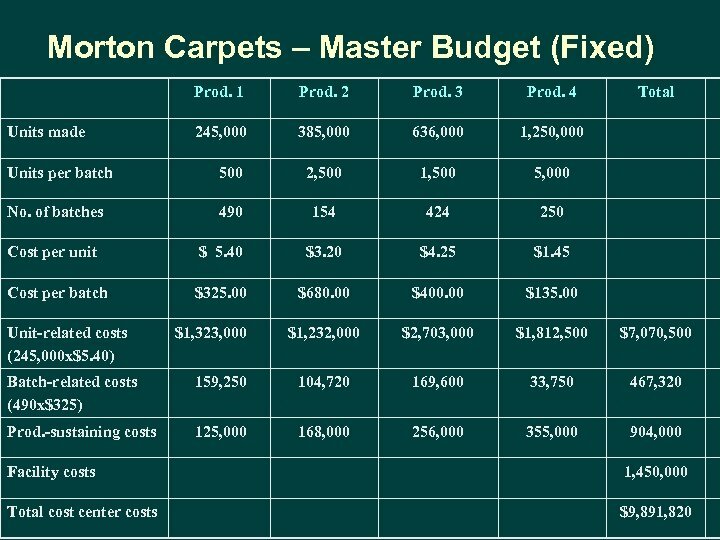 Because of these volume differences, it is inappropriate to compare the cost targets in the master budget with actual cost results. What can managers do to make the numbers comparable and meaningful? 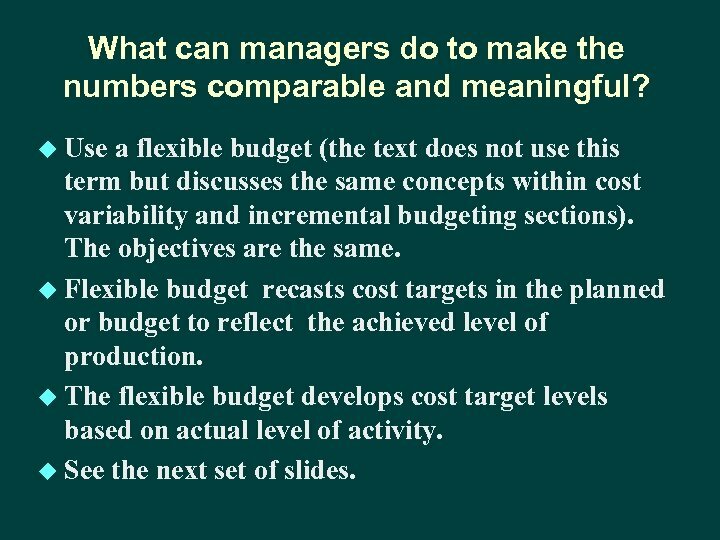 u Use a flexible budget (the text does not use this term but discusses the same concepts within cost variability and incremental budgeting sections). The objectives are the same. 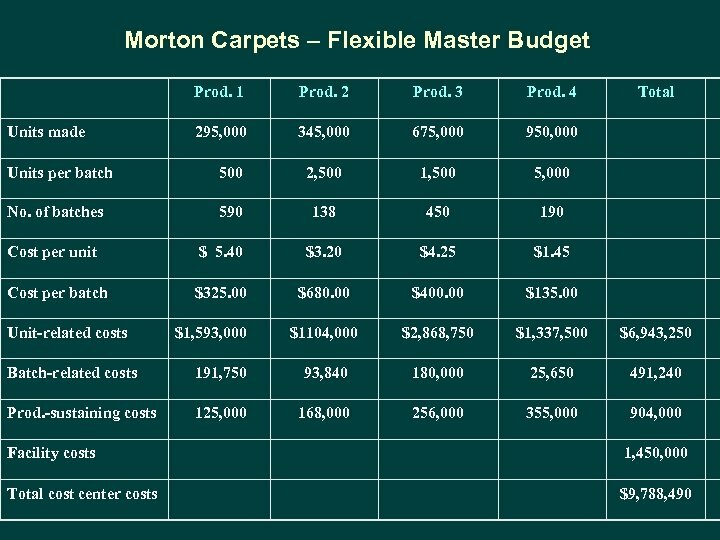 u Flexible budget recasts cost targets in the planned or budget to reflect the achieved level of production. u The flexible budget develops cost target levels based on actual level of activity. u See the next set of slides. 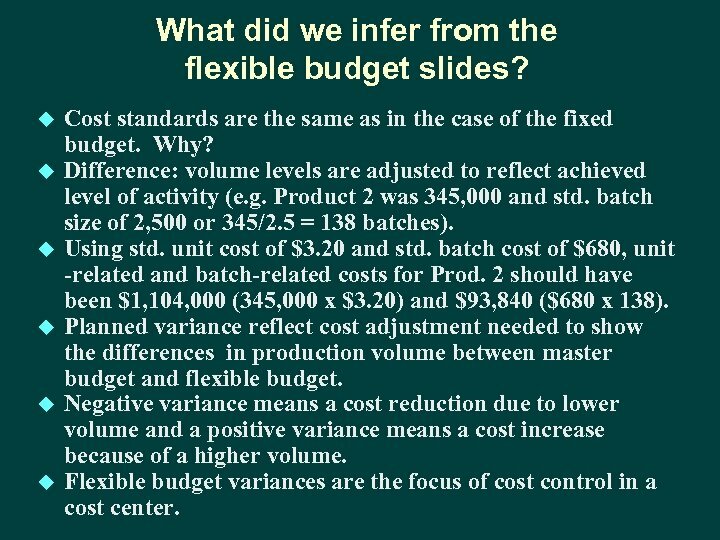 What did we infer from the flexible budget slides? u u u Cost standards are the same as in the case of the fixed budget. Why? Difference: volume levels are adjusted to reflect achieved level of activity (e. g. Product 2 was 345, 000 and std. batch size of 2, 500 or 345/2. 5 = 138 batches). Using std. unit cost of $3. 20 and std. batch cost of $680, unit -related and batch-related costs for Prod. 2 should have been $1, 104, 000 (345, 000 x $3. 20) and $93, 840 ($680 x 138). 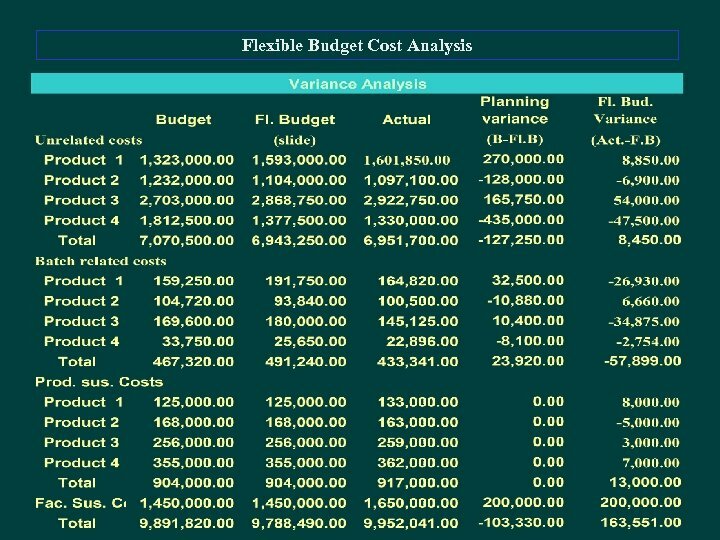 Planned variance reflect cost adjustment needed to show the differences in production volume between master budget and flexible budget. Negative variance means a cost reduction due to lower volume and a positive variance means a cost increase because of a higher volume. Flexible budget variances are the focus of cost control in a cost center. 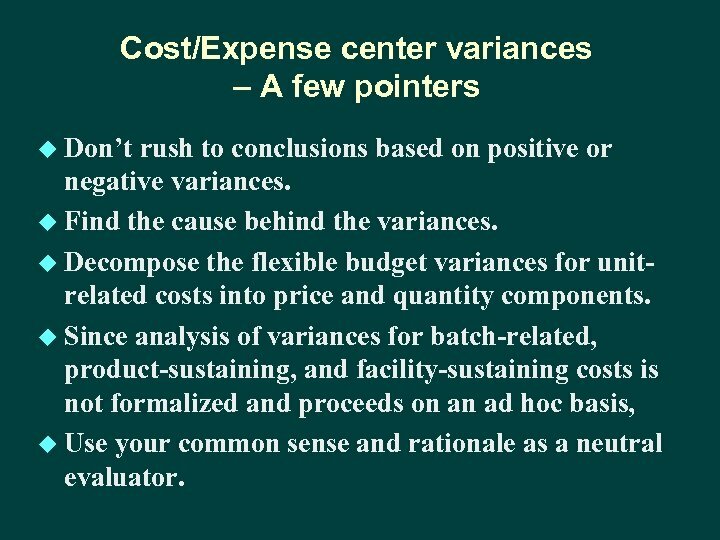 Cost/Expense center variances – A few pointers u Don’t rush to conclusions based on positive or negative variances. u Find the cause behind the variances. u Decompose the flexible budget variances for unitrelated costs into price and quantity components. u Since analysis of variances for batch-related, product-sustaining, and facility-sustaining costs is not formalized and proceeds on an ad hoc basis, u Use your common sense and rationale as a neutral evaluator. 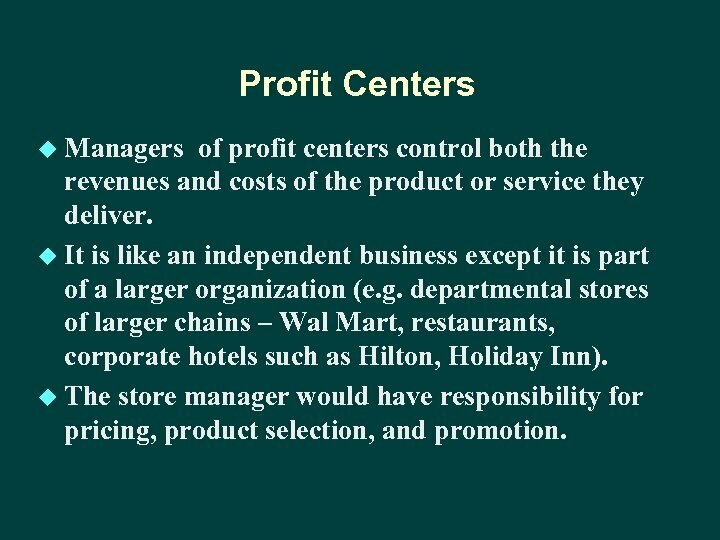 Profit Centers u Managers of profit centers control both the revenues and costs of the product or service they deliver. u It is like an independent business except it is part of a larger organization (e. g. departmental stores of larger chains – Wal Mart, restaurants, corporate hotels such as Hilton, Holiday Inn). u The store manager would have responsibility for pricing, product selection, and promotion. 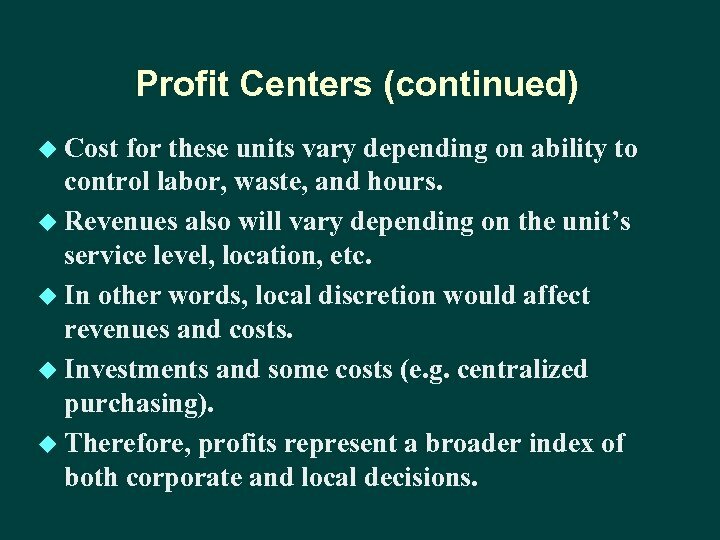 Profit Centers (continued) u Cost for these units vary depending on ability to control labor, waste, and hours. u Revenues also will vary depending on the unit’s service level, location, etc. u In other words, local discretion would affect revenues and costs. u Investments and some costs (e. g. centralized purchasing). u Therefore, profits represent a broader index of both corporate and local decisions. Profit Centers (continued) u If performance is poor, it may reflect poor conditions that no one in the organization could control as well as poor local conditions. u For this reason, organizations should not evaluate performance only based on costs and profits, but u Perform detailed evaluations that include quality, material use, labor use, and service measures that the local unit can control. 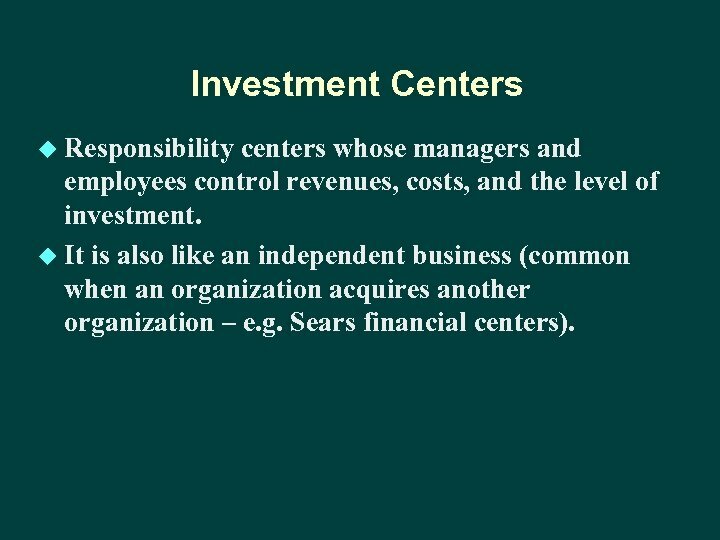 Investment Centers u Responsibility centers whose managers and employees control revenues, costs, and the level of investment. u It is also like an independent business (common when an organization acquires another organization – e. g. Sears financial centers). Administrative Centers (support centers) u One of the most difficult to evaluate because neither the input nor the output is easy to measure (e. g. accounting services, marketing), and u Linking unit’s input and output to organizational objectives. But, with a little careful approach, the costs of such centers can be reasonably computed. u Since most of these centers are treated somewhat like cost centers, an approach based on costs would be helpful. What did we learn from these control system illustrations? 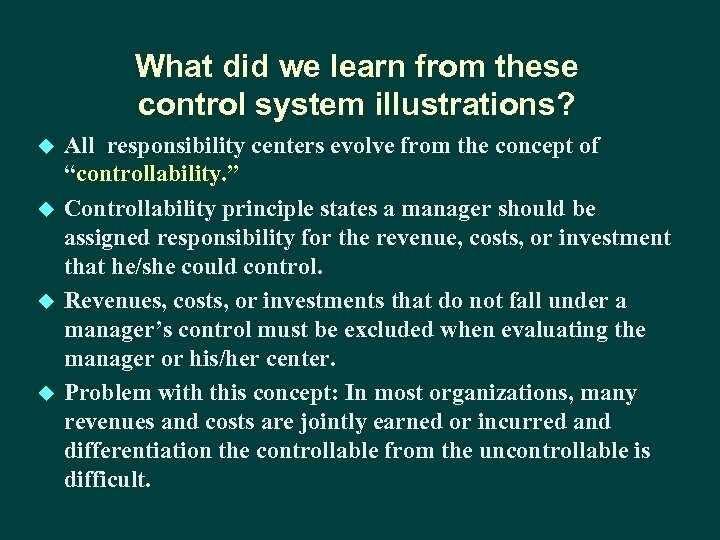 u u All responsibility centers evolve from the concept of “controllability. 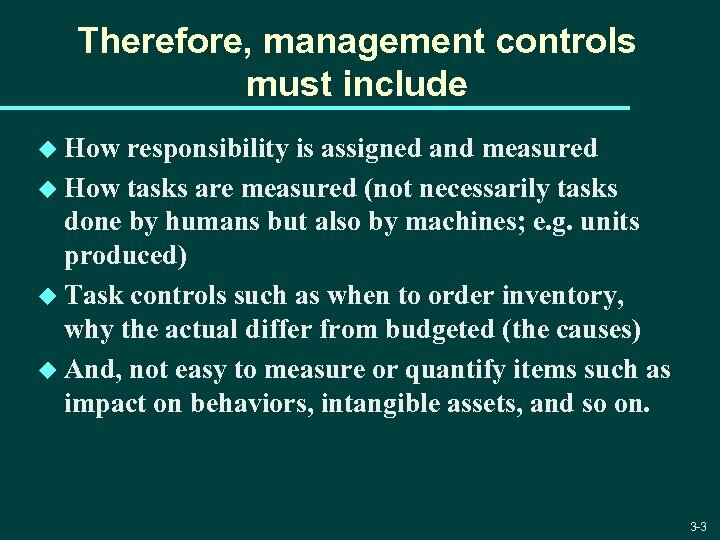 ” Controllability principle states a manager should be assigned responsibility for the revenue, costs, or investment that he/she could control. 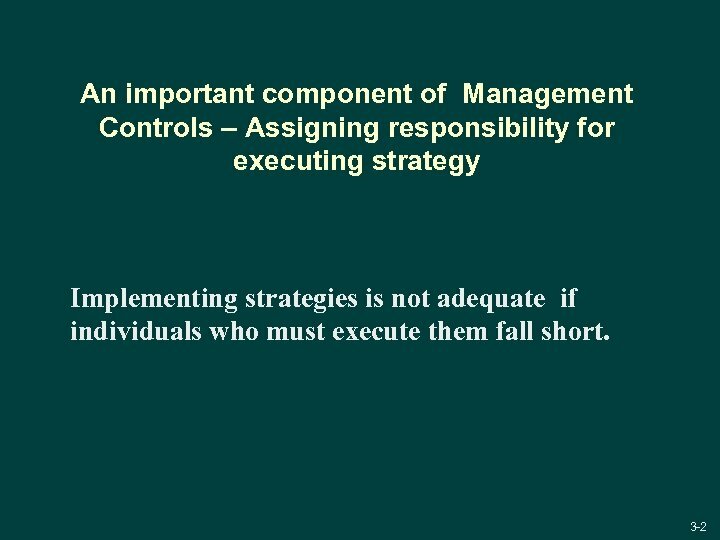 Revenues, costs, or investments that do not fall under a manager’s control must be excluded when evaluating the manager or his/her center. Problem with this concept: In most organizations, many revenues and costs are jointly earned or incurred and differentiation the controllable from the uncontrollable is difficult. 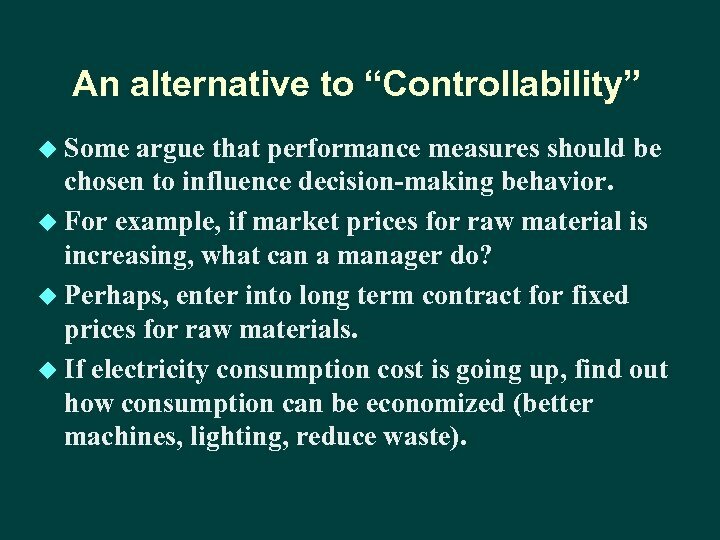 An alternative to “Controllability” u Some argue that performance measures should be chosen to influence decision-making behavior. u For example, if market prices for raw material is increasing, what can a manager do? u Perhaps, enter into long term contract for fixed prices for raw materials. u If electricity consumption cost is going up, find out how consumption can be economized (better machines, lighting, reduce waste).